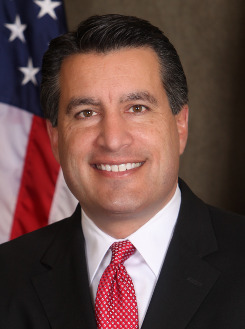 Attorney and judge elected Governor of Nevada in 2010, succeeding Jim Gibbons. Moderate Republican; pro-choice but opposes partial-birth abortion and federal funding for abortions, pro-death penalty, pro-gun rights. Campaigned calling for lower taxes, sound fiscal policies, and respect for the Second (gun rights) and Tenth (state sovereignty and individual rights) amendments. Has been an active opponent of storing high level nuclear waste at Yucca Mountain, a key issue in the state. First Latino Governor of Nevada.